Busch Gardens Tampa Bay launched its third annual Food and Wine Festival this past weekend. And it’s better than ever with expanded entertainment offerings and of course delicious food and spirits! With expansions to the comprehensive food fare and concert lineup, the festival has something for everyone. During my unofficial guided tour by one of the individuals who helped build many of the sets, I learned just how much time, care, and attention went into each and every element right down to the lightbulbs. Best part about the festival is just how much like a festival it feels. While Epcot’s International Food and Wine Festival is by far larger, more comprehensive, and boasts a larger variety of food and alcohol, the Busch Gardens Food and Wine Festival includes the quaintness that non-theme park food and wine festivals have–or at least the very idea of food and wine festivals as it appears in our mind. Virtually the entire area from the front of the park to the flamingos is filled with artisan kiosks, food and wine vendors, and performing artists. Coca-Cola makes a huge splash at the food and wine festival this year with its beautifully decorated sponsor area on the far side of the main festival thoroughfare adjacent to the flamingos. Debuting this year is this new expansion featuring Coca-cola products and more food! Some guests from Howl-O-Scream may remember this as a scare zone last year. I absolutely adore the brilliance of the nighttime display in the Coke area. It’s incredibly stunning and just goes to show the increase in quality at this young festival. A great deal of attention was put into the design of the decorative light and luminary fixtures. Lots of glass Coca-Cole bottles with light inside along with exposed string lights help to create a warm, inviting atmosphere. Be sure to checkout the Coke-flavored chocolate dessert in the Coca-Cola area; I’ve heard it’s delicious! And, I am definitely going to try it when I return to the festival throughout the event. Before taking a stroll down the main festival walkway to procure some delectable goodness, I desired to check out the topiaries and performing arts. The two entertainment offerings that impressed me the most were the ice carving and Living Fountain. The Living Fountain is located near the main festival grounds in the gorgeously landscaped garden area between the festival grounds and the Australian animal encounters. Busch Gardens takes the concept of living statues to the next level. Living statues are a little all-too-common around Central Florida, so Busch needed to find what others were doing and perfect it–they did just that! More than living art (which is beautiful in and of itself), the Living Fountain turns a breathtaking living statue and transforms it into a show including water effects. Watch as the statue comes to life and dips her fingers into the enchanted fountain of crystal clear refreshing water and sprinkles it around on the earth allowing life to grow abundantly. Just down the walkway, past the main entrance into Gwazi Field is the ice sculpture exhibit and show. Twice a day (once, during the day and again in the evening), watch as one or more ice sculpture artists turn a block of solid ice into a work of art. As I understand it, the artist never repeats a design (at least in the same day). The experience between the day and night differs only slightly. During the day, the ice sculpture artist takes his time in creating the sculpture and you can casually enjoy the evolution from an expressionless block of ice to a beautiful creation. The process of turning the ice into a sculpture takes about 1.5hrs from start to finish. If you choose to walk by the ice carving area at night, then you’ll witness a slightly more invigorating experience because you’ll watch as two ice carvers dual one another. You’ll be amazed at how drills, chainsaws, and jigsaws are used to create incredibly works of art. Enhancing the experience at night are added lights that illuminate the ice. But what about the food?!? Whatever kind of food you are in the mood for, you will likely find something to satisfy even the most discerning of palettes. Many of the food and drink offerings can be found along the main walkway, with a handful of kiosks sprinkled around the outside of Gwazi Field. Lobster, venison, shrimp, chicken, and more can be found at the Busch Gardens Food and Wine Festival this year. From new twists on good old-fashioned comfort food to trendy foodie delights, there is no shortage of variety for the park guests this year. The food prices are on par with pricing at similar events including Epcot Food and Wine. With the city of Tampa becoming increasingly known for its foodie and craft beer scene (presently ranked as a top foodie and craft beer locale according to several travel blogs and magazines), it was important for one of the most visited places in Tampa to uphold that growing reputation. Busch Gardens does precisely that with the sheer variety of food, wine, cider, and beer at this year’s event. Since I frequent the event several times over the course of its run, I typically have one or two food items and a glade of wine or two as to not break the bank (haha). This past weekend, I had the highly recommended grilled cheesecake sandwich and key limmen wine. As I am not a food critic nor sommelier, I can only tell you that the dessert was just sweet enough without being too rich, and the wine is mostly dry with a hint of sweetness that paired perfectly with my dessert. I appreciated how the combination wasn’t too sweet, thus allowing me to enjoy the full body of favors. While you are enjoying your food and beverages, be sure to catch the Busch Garden’s jazz cover band at the Peacock Stage. A big draw to the Busch Gardens Food and Wine festival is the concert lineup each evening! Such a wide variety of music that should pair nicely with anyone’s taste. I did not stay for the concert, but I’ve heard the concerts are packed, and the park guests are thoroughly enjoying their time. On the topic of concerts though, there are three different concert packages that are available for purchase. Two out of the three include food and drink punch cards that give you a fixed number of complementary selections of the food and wine at the festival. The third package does not include food but does include a reserved seating section. Depending on which package you purchase will correspond to the reserved seating section. Sitting closest to the stage is the Tier 1 package and it goes back from there. The concerts are FREE; however, to ensure that you have a seat at the event, you may want to purchase one of the packages. For those who just cannot justify that additional expense in their respective budgets, there is an open seating section as well as plenty of standing room. You can even sit on the ground should you choose. 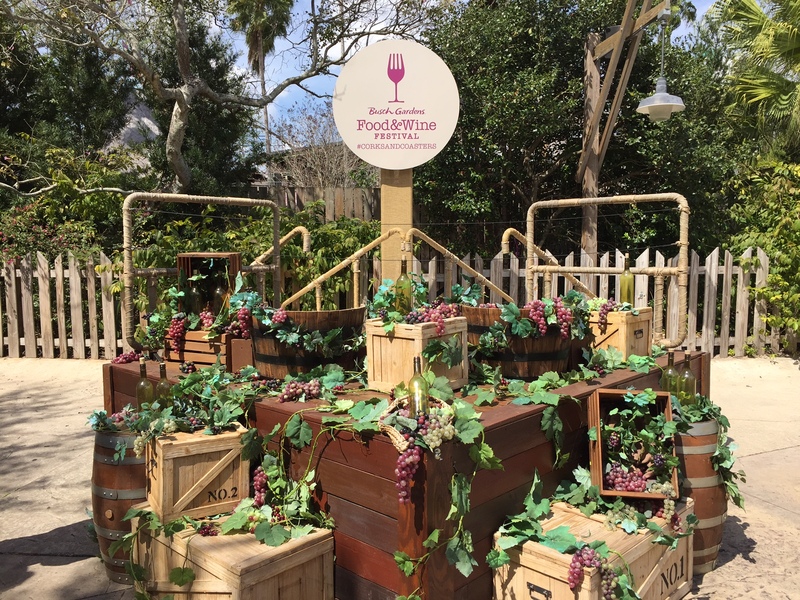 Food and Wine at Busch Gardens is going on now through April 30th. Don’t miss it!